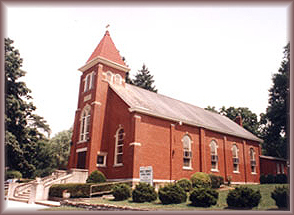 Holy Trinity Parish has been the Catholic presence in Batavia for over 100 years thanks to the dedication and determination of a small group of local Catholics. In order for them to attend Sunday Mass, at either St. Louis Church, Owensville or St. Philomena, Stonelick, they had to traverse poor roads or brave bad weather. Some even walked miles. In 1905, with John Hartman as spokesperson, a group of these Catholics approached Archbishop Moeller with a request that a priest be sent to celebrate Mass in Batavia. Several trips and exchanges of letters ended with the Archbishop’s informing the people that no priest was available to make trips to Batavia on Sundays. Mr. Hartman then contacted a former high school teacher, who was by then the Provincial of the Franciscan Order. In reply, Fr. Chrysostom Theobald promised to send a Franciscan priest to offer Mass if the Archbishop approved. Archbishop Moeller granted permission contingent on the people making all the preparations. They obtained the use of the John Klein Building on Main Street with free rent for one year. On march 11, 1906, the first Mass was celebrated in Batavia by Fr. Chrysostom Theobald. The Franciscans continued to offer Mass there on an average of twice a month until 1910 when the new church was dedicated. With the help of a prominent local citizen, and Wendel Klein, the property at Sixth and Wood Streets was purchased for $2000. The parishioners began to raise funds to build a church. Tickets for bricks were sold for 5 cents a brick. In 1909 George M. Sheilds of Bantam agreed to build the church for $5185. Members donated pews, windows, altars, the bell and other furnishings. On October 29, 1910, Fr. Meyer wrote to the Archbishop asking permission to reside at the then unoccupied parish house on the grounds of St. Philomena Church, Stonelick. In the 1920’s the parish grew to 60 families. Decisions were made to improve and expand the parish facilities. A new roof was put on the church in 1922. An addition was to be put on the church building which would enlarge the sanctuary and provide sacristies. A house had been purchased which was serving as a rectory and a temporary parish hall. To provide a larger, more permanent hall, a project was begun to dig out a basement under the church. The church building was propped up on pillars during the digging. Four more lots behind the church building were donated to the parish. With the parish growing, it was determined that a pastor would be sent to reside in Batavia. In 1952, the current house which served as the church offices was purchased for the sum of $8500. It was remodeled to serve as the parish rectory. In the same year the interior of the church was renovated for the sum of $11,000. The metal ceiling and light fixtures were removed, and a plastered ceiling, painted and decorated with wooded beams was constructed, and new light fixtures installed. The new altars and a large crucifix were placed in the church. All of the woodwork was cleaned and brightened. In the 1960’s, a shrine was built in the east church yard as a memorial to Carl Legner, faithful custodian of many years. On June 28, 1964, ground was broken for a new catechetical and social hall to cost $60,000. The hall was completed and dedicated by Archbishop Karl J. Altar in May 1965. In 1966, the perishing lot was constructed. In the same year the church sanctuary was renovated to conform to the reforms for the Liturgy coming out of the Second Vatican Council. A new altar facing the people was installed for the celebration of the Mass, along with one on the side for the reposition of the Blessed Sacrament. A new presidential chair was purchased, and the sanctuary floor was carpeted. In the 1970’s the directives of Vatican II continued to be implemented in the parish. Lay Liturgical ministries were implemented in the parish, and the Parish Pastoral Council began to function as a consultative body to the pastor to assist him with the pastoral visioning, and decision that needed to be made in the parish. With the shortage of Religious women becoming apparent, lay volunteers began to step up and take on the roles of religious education and formation of children in the parish, as well as visiting the sick and shut-ins. The St. Vincent DePaul Society became active in the parish answering the needs of those less fortunate in the local area.. With the completion of the construction of Clermont Mercy Hospital, and the Golden Age Rest Home, the pastor assumed the responsibilities of chaplain at these institutions, as well as remaining pastor of Holy Trinity Parish, as well as pastor of St. Philomena in Stonelick. In 1980, Michael Paranuik, a native son of the parish served as a deacon in the parish, and the following year was ordained to the priesthood. Further renovation of the interior of the church took place in 1982, the communion rail was removed, the sanctuary platform extended, the sanctuary floor and aisles covered with new carpet. The wood floors under the pews were restored and refinished. A Reconciliation room was constructed at the rear of the church, and the baptismal font moved to the front of the church. In 1984, Fr. Edward Connelly, who served as pastor at Holy trinity for 9 years, died after a short illness. The Pastoral Council recommended that the name of the parish hall be changed to Connelly Hall in his memory. Jim Hennessey, a member of the parish was ordained a permanent deacon on June 22, 1985. In 1990, the parish began to share a pastor with St. Ann in Williamsburg. Also in the 1990’s, the church and hall were air conditioned, plus new carpet and drapes were installed in the church. Around this time, Fr. Bill Stockelman moved out of the rectory, enabling it to be converted completely into offices. In the late 1990’s the church was again renovated, and the basement of the church was refurbished, adding a spacious bathroom. A bequest by Mrs. Helen Rosselot made possible the barrier free church access, safe interior stairs, and landscaping for the Marian grotto. The Statue was donated by the parish Rosary Altar Society. In 2005, the parish celebrated the 20th Anniversary of the ordination of Deacon Jim to the Permanent Deaconate. The following year, the parish constructed a new rectory to serve as a residence for the pastor, and the during that same year, 2006, the parish celebrated its centennial, 100 years of faith in the community. Parish activities such as “Donut Sunday”, and “Cooking with Rita”, as well as group events, youth events, and bible studies, among others, marked the centennial celebration. In 2006, the parish started a fish fry. Re-launched a parish festival, began publishing a quarterly newsletter. July 1 2012 Fr. Jerry Hiland began the Parish Region between Holy Trinity, St. Ann, St. Louis and St. Philomena. These four parishes together makeup the Clermont Catholic Communities.